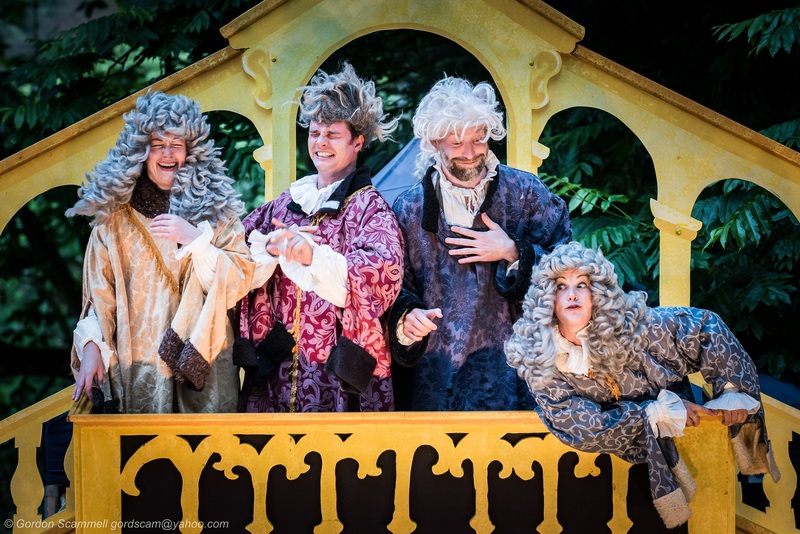 Riotous isn’t usually a word that I associate with The Merchant of Venice, but it’s really the only word that does justice to Illyria’s madcap outdoor production currently touring around the UK. 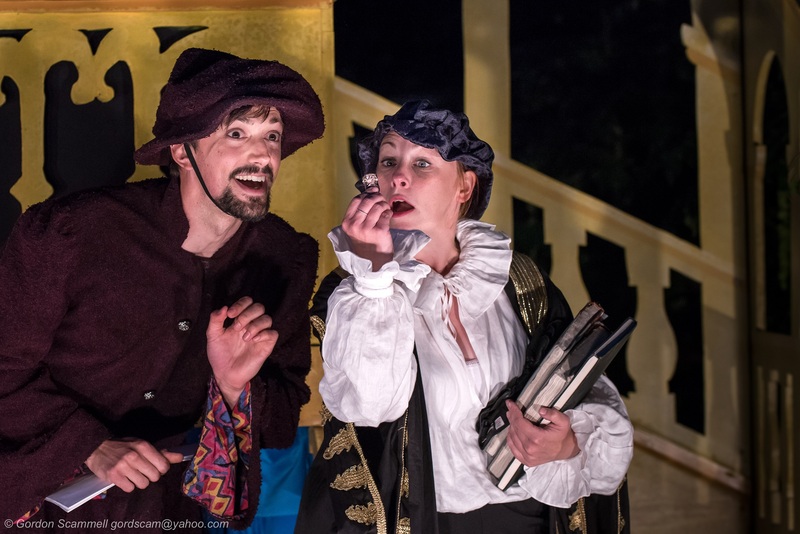 Performed by a band of only five actors, who don a breathless variety of roles by running round the back of the stage and reappearing with a new coat or hat (leaving us in tears of laughter while doing so), it was perfect summer Shakespeare. Plus, before I get going, here’s a funny story: we’d also meant to see an outdoor Merchant at Westminster Abbey earlier this month, but as the day moved into evening and the sullen rain strengthened, we decided to chicken out. Imagine our amusement when we arrived at Arundel Castle for our Illyria expedition, and realised that the Westminster show had been Illyria too! We could well have ended up seeing the same show twice. Not that this would have been any great hardship, I hasten to add. I’m sure virtually everyone knows the story of The Merchant of Venice but, just in case… Antonio is the titular merchant: a wealthy Venetian bachelor whose feckless young chum Bassanio (and here they are just chums, which isn’t always the case) comes begging for money to go after the lady of his dreams. Said lady is Portia, an orphaned heiress whose late father devised a cunning riddle for her suitors, to ensure that only the right kind of chap can get his hands on her fabulous riches. The only problem is that Antonio doesn’t have any ready cash, having entrusted it all to his merchant-ships scattered across the sea-routes of the world. But, to tide them over until his ships get back, he decides to borrow the necessary sum from Shylock, a Jewish moneylender. Shylock is startled by Antonio’s arrival – after all, Antonio has called him names and spat on him a hundred times, and now he comes asking for money? But Shylock realises that this might be a way to get his revenge on Antonio, and so he smiles and offers the money – without interest, but just a single condition, a jolly jest: that if Antonio doesn’t pay the money back in time, Shylock can claim a pound of his flesh in payment of the debt. The Merchant of Venice was described, at the time it was written, as a comedy. That seems hard to believe nowadays, when its plot revolves around such unsettling themes of anti-Semitism, but Illyria did a magnificent job of pulling out all the humour they could. The tone of the production was set from the very beginning, as the cast list in the programme presented a dizzying array of names: in order to bulk out their five-strong cast, the company had come up with a different anagram of the actors’ names for each of their roles. And, once the production got underway, there was plenty of comedy in the scramble to change costumes as an actor left the stage in one role, only to rush on in another (a special mention to Chris Wills, who managed to play both Bassanio and the Duke in a single scene). Extra humour was added by the chorus of Venetians who gathered at the top of the production’s Rialto Bridge to comment on proceedings, coming across as close kin of The Muppets’s Statler and Waldorf. Indeed, it was an ensemble piece in the very best way. The only characters played completely straight were Antonio (Beau Jeavons-White) and Shylock (David Sayers), both of whom had dignity and, in Shylock’s case, a palpable sense of tragedy. Shakespeare’s play prevents us from completely identifying with Shylock, but it does allow us to feel for him: mocked by his Christian business associates; abandoned by his servant; betrayed by his daughter; and, finally, destroyed by the very law on which he’s rested his hopes. And David Sayers brought out that inner humanity – though not sacrificing the opportunity for a bit of teeth-gnashing at the appropriate moments. Apart from these two, all the characters were given full comic rein, most visibly in the gender-swapped casting of Gratiano (Katy Helps) and Nerissa (Beau Jeavons-White). Nobody ever mentioned the fact that Nerissa was heavily bearded for a lady’s maid and was about a foot taller than her lover. And of course it added a mischievous touch of madness to the scene in which Portia (Nicola Foxfield) and Nerissa disguise themselves as young lawyers (Nerissa becoming a man playing a female role originally played by a boy dressed as a girl who’s temporarily disguised as a boy. Keep up). How they figured out how to split the parts, I’ll never know: it must have taken some mental gymnastics to work out which characters are never in the same scene, which becomes more complicated as the worlds of Belmont and Venice collide at the end. But it was managed beautifully. 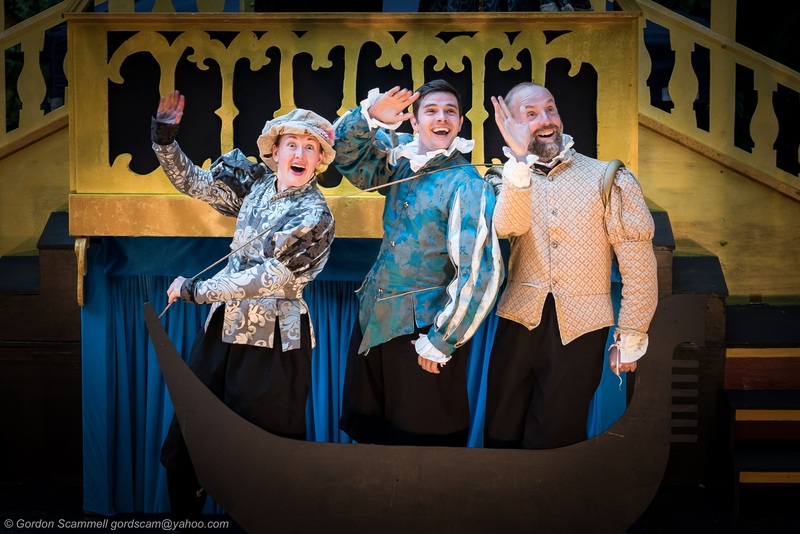 While I can’t single out any particular actor as my favourite, due to the ingenious tripling (or more) of roles, I salute them all as a team for coming up with the liveliest and certainly the most amusing Merchant I’ve seen. There’s a place for darker interpretations of this play, and I rather like the film with Jeremy Irons and Al Pacino, but for a warm summer’s evening in the gorgeous surroundings of the gardens of Arundel Castle, I really can’t think of anything more fitting. Illyria weren’t on my radar at all before this show, but they are now, and I’m keen to see much more by them. Oh, and quite apart from the play, Arundel Castle is magnificent. I’m going to have to go back, because we didn’t have enough time to go inside, due to (ahem) getting distracted by Kim’s Bookshop on the High Street (having already been extremely distracted by their branch in Chichester. Let’s just say I ended up lugging lots of books round with me).